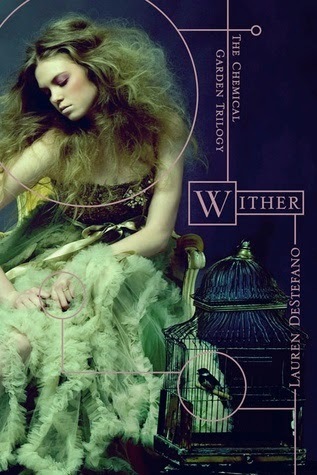 Wither is the first book in The Chemical Garden Series and is my new obsession. Although Wither came out in 2011, it has only just found it's way onto my bookshelf and I'm so annoyed I didn't pick it up sooner. Lucy reviewed this book here on Blogger's Bookshelf back in 2013 but I'm so in love that I couldn't help but re-review it. Rhine is a sixteen-year-old girl living in a world where a brutal virus kills girls at age twenty, and boys at age twenty-five. Geneticists are experimenting with possible cures to restore the human population and the need to reproduce is a vital importance to every young child. The book begins with Rhine being kidnapped and sold to a man who will make her his wife and potentially have her bear his children, alongside two other girls - one as young as thirteen. The story develops around these three girls, their husband Linden and their lives within his luxurious mansion. This story was one that had me loving the plot but hating the events at the same time. DeStefano's writing had me imagining a world in which this would happen and to see the way the girls were expected to behave made me feel sick. Whilst it was a dystopian world I would hate to live in, I was fascinated to read about it and I wanted to know more. The girls were stuck between living a life of luxury, getting to know the man they thought they hated and reminding themselves how they got to be where they are now - the confusion in Rhine's mind was so realistic, as a reader I really got to understand how she was feeling the way she was, through DeStefano's amazing writing style. Whilst I sped through this book, I wouldn't particularly say that it was fast-paced. It isn't an action-packed book with twists and turns, but it still had me hooked as though it was. The focus is mainly on the girls and their relationships with one another, their husband and the other characters within the mansion - and it was fascinating to read about. I would definitely recommend that you start this series - Wither has definitely been added to my favourite books of all time.